Camelina sativa is a flowering plant that also goes by the names of gold-of-pleasure, false flax, wild flax, linseed dodder, German sesame, and Siberian oilseed. It belongs to the same Brassicaceae family as mustard and broccoli. Native to Europe, where it has grown for at least 3000 years, and Central Asia, it now grows on all continents and is cultivated as a short seasoned, fast growing oilseed crop. The Camelina is an annual that produces a multitude of small, pale-yellow to greenish yellow flowers with four petals and pea sized seed pods. The tiny seeds are 40% oil and about 400, 000 of them barely weigh half a kilo. Cold pressed, organic Camelina Oil is golden yellow to olive green in colour with a mild and nutty almond-like flavour and a green herbaceous aroma. Considered by many to be a weed, the camelina plant is largely underappreciated nowadays. 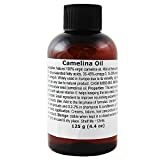 Camelina oil was a common cooking oil until the cheaper hydrogenated fats took over but it is undergoing a bit of a revival, especially in organic circles. Camelina Oil is particularly rich in Omega-3 essential fatty acid, rivalling the amounts found in flax seed and fish oils. Omega-3s are woefully deficient in the modern diet. The advantage of Camelina over flax is that it is much more stable, with a longer shelf life due to its unique antioxidant profile which helps it to resist oxidation. It also does not pose the same risk of contamination that fish oils do. Besides Omega-3 fatty acid (alpha-linolenic acid) Camelina Oil has the essential Omega-6 fatty acid (linoleic acid) in a good ratio of 1:2. It is more than 30% monounsaturated, with the stable oleic and gadoleic fatty acid present, which make Camelina very balanced. It is also one of the highest natural sources of γ-tocopherol (one of the many forms of vitamin E) and has higher than normal levels of other natural tocopherols and tocotrienols, which protect DNA against free radical damage, and a wide range of phytosterols. Due to its high EFA (essential fatty acid) and linoleic acid content, Camelina Oil is very kind to the skin, acting as an anti-ageing emollient which improves suppleness and elasticity. 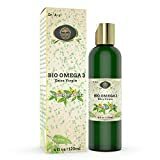 It is also a functional food, providing a much needed source of Omega-3s which are important for cardiovascular health, good cholesterol levels, brain function, growth and development, prevention of depression, mental illness, Alzheimer’s, inflammatory diseases like diabetes and skin diseases. As a rich source of Polyunsaturated Fatty Acid (PUFA’s) Camelina Oil is an excellent choice for use in nutraceuticals, cosmetics, toiletries, lip balms, body butters, soaps, OTC medicines and sun care products. As a home remedy it is good for stomach ulcers, burns, wounds and eye inflammation. It is also reputed to be great for dogs, giving them a healthy glossy coat. Camelina Oil is a good substitute for olive oil in cooking, salads, dressing, dips, baking and light sautéing. It has quite a high smoking point and is very versatile. Mix oils together and use anywhere for a luxurious, soothing and anti-aging effect - around eyes, on the lips, neck or hands.